Software security expert Gary McGraw went to a White House meeting on cyber security attended by 100 public and private sector security experts. McGraw shares the details of the meeting, including an unannounced visit by President Obama. 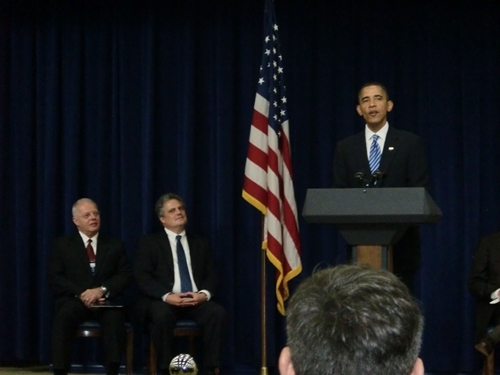 On Wednesday, July 14, 2010, U.S. Cyber Security Coordinator Howard Schmidt convened a hastily called meeting of around 100 public and private sector security experts at the White House to explain the progress he has made in the six months since he joined the administration. I was there. In an unexpected and exciting surprise, President Obama stopped by the meeting and spoke for 15-20 minutes. Here is a picture I took of President Obama addressing the meeting. Howard Schmidt is to the far left. Beside him is Department of Homeland Security (DHS) Deputy Undersecretary Phil Reitinger. In addition to remarks from President Obama and Howard Schmidt, the meeting was addressed by two cabinet Secretaries—Janet Napolitano, Secretary of DHS, and Gary Locke, Secretary of Commerce. The invitation-only event included members of the Administration, state and local government officials, law enforcement officers, select industry executives, academics and representatives from privacy and civil liberties groups. Attendees who I know included Matt Blaze, Carl Landwehr, Ed Amoroso, Marc Rotenberg, Eugene Spafford, Mischel Kwon, and John Savage. In a panel discussion just before the President arrived (unannounced), Ed Amoroso observed that for the first time in his many years coming to Washington, D.C. it is clear that “this Administration gets it.” This is certainly the most important message from the meeting. The fact that the President takes the time to address a group of cyber security people even with the pressing concerns of the fragile recovering economy, the war in Afghanistan, the BP oil debacle, and looming mid-term elections demonstrates the importance that the President places on cyber security. The President got a knowing laugh from the audience when he explained how his demographic is caught between generations technologically. Unlike many of the baby boomers, Obama pointed out that he certainly knows how to use a blackberry (and according to rumor helped to cause S/MIME to be made available for encrypted email on the blackberry platform), but at the same time he has little idea of how to build a mobile application for one or of how blackberries work in detail. Technological cluelessness seems to be a common predicament among policy makers, so it is nice to have a President who understands and uses technology. Fortunately, the President understands that civil liberties and security sometimes work at cross purposes. He noted that as a society we have conflicting values that will need to be debated and hashed through. He neither ignored nor shied away from privacy and civil liberty concerns. The moment President Obama entered the meeting was electric. Attendees immediately stood and gave him an ovation. The room was energized, and the President’s charisma was palpable. I, for one, was proud to be there. My invitation to the White House arrived via email from Karen Richardson who has an email address from the mail server who.eop.gov. The mail was unsigned and unencrypted. It could very well have been a spear phishing attempt, especially since it requested that I send in my social security number to facilitate a background check (and included no phone number for out of band communication or confirmation). Over the weekend, I began to wonder whether the invitation was real. I even looked up the server’s DNS records on on whois. Fortunately, Howard gave me a call and allayed my concerns. Nevertheless, this little story clearly demonstrates the problem that we all face when it comes to cyber technology. Summoning an audience via email is only natural, and it’s easy and efficient, but if the audience is hyper-aware of security concerns, the very message itself may be rejected! I do use S/MIME for authenticated mail, but only with a small circle of fellow security geeks. In some respect, the tools that we need for better security already exist, but they are not adopted widely…even at the White House. Though it is nice to see that real progress is being made, my main concern has always been (and remains) an emphasis on building security into systems—especially from a software perspective. I would like to see the government make more progress adopting and adapting software security practices. In my view, the government (even including the military) is several years behind the private sector when it comes to software security. This is not simply a procurement issue, nor is it an operations issue; it is an issue of security engineering competence. In my view, unless we focus attention on the root cause of security problems (software), everything else is window dressing. That said, as evidence of progress, Secretary Locke pointed to the upcoming deployment of DNSsec at the root nodes of .com, .us, .edu, and .gov domains. This is a long awaited and long anticipated development. He also discussed NIST’s involvement in identifying standardized security controls (in concert with the NSA) and NIST’s national initiative for education in cyber security. Though NIST is certainly working hard in the cyber security space, they are not exactly thought leaders. Secretary Napolitano made clear that her vision for DHS includes shepherding cyberspace as one of its top five priorities (along with counterterrorism, border security, disaster response, and immigration). DHS has tripled the number of cyber security practitioners on its staff (and will double that number next year). They have finalized a national incident response plan to activate in the face of a cyber event. And they created and staffed a cyber security incident response center. Of course this is reactive security at its finest, when what we really need is more proactive security. Strategically, DHS intends to reduce the number of Internet connection points in government networks, and reinforce the remaining connection points with the recently declassified Einstein intrusion detection system. Secretary Napolitano reports that 12 of 19 Federal agencies are now using Einstein 2, and that all 19 will be covered by year’s end. This is important progress to be sure, but it is also catch up ball. Secretary Napolitano emphasized that DHS understands cyber security, has assembled a strong team, and is working closely with the private sector to make tangible progress. My favorite quote from Howard was “a plan to make a plan is not a plan.” Howard was keen to demonstrate forward progress while at the same time acknowledging that challenges remain. He believes that we are at a crossroads and that now is an excellent time to make long term changes that will impact cyber security going forward for years. He pointed to the recently realigned and centralized cyber command under General Alexander, enhancement of FISMA to move it beyond an exercise in paper pushing, institutionalizing incident response capability, and focusing the Department of Energy on assessing and testing power grid cyber security. I look forward to more progress reports like the one that we just had. Hopefully the future will bring more emphasis on software security and building things right in the first place. Protecting the broken stuff from the bad people remains a losing proposition. Howard described his impressions of the meeting and its purpose on the White House blog. An official progress report is also available there.